There are two different factors to determine how close a viewer should sit to the screen of their home theater (field-of-view and picture resolution). To choose a proper distance, it is necessary to understand the impacts of both, and understand when trade-offs occur. 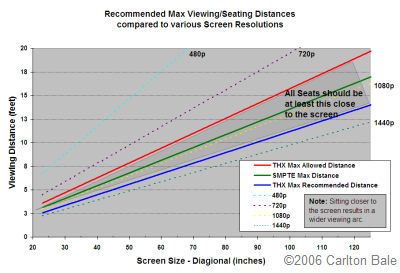 Field-of-View based viewing distances: The THX and SMPTE specifications are based on a field-of-view being a certain width or wider, meaning that all seats must be closer than a certain distance to the screen. In general, the wider the field of view (the closer the viewer sits to the screen), the better. This specification does not take screen resolution into account. Resolution based viewing distances: The Visual Acuity distance is based on resolution of the screen vs. the resolution capability of the human eye. Unlike the field-of-view based distances, this occurs at a fixed distance from the screen (where eye resolution = screen resolution). If the viewer moves further than this distance from the screen, they start losing out on the available resolution of the screen (eye resolution < screen resolution). If the viewer moves closer than this distance to the screen, the deficiencies in the projected image start to become more apparent (eye resolution > screen resolution). This specification does not take field-of-view into account. I was recently asked if sitting 2/3rds of the way back in a commercial theater is too close. The answer is: it depends. You would need to 1) specify the resolution of the screen (pixels or film grain size) and 2) specify which is more important to you: a wide field of view -or- no apparent resolution deficiencies -or- both. Maybe the resolution is so high that sitting even closer would result in both better perceived picture quality as well as a more immersive field-of-view. Maybe not. It depends on the image resolution. In my personal opinion, I think that having a wide field-of-view is the most important factor. Also, resolution-based seating distances are subject to much more person-to-person variation and are more of an estimate than are field-of-view calculations. However, every seating distance that meets the THX specification is not necessarily a great place to sit because the THX specification does not take screen resolution into account. It is important to understand the limitations of the THX spec, understand the interaction with screen resolution, and then choose the equipment and the seating configuration that best fits your needs. “Proper seating distance” is not an easy value to define and is truly in the eye of the beholder. But it is worthwhile to understand the various factors when looking for it. If you’re wondering what the proper seating distance should be for your specific home theater, you may be interested in my Home Theater Calculator Spreadsheet. Next Post: A Link from EngadgetHD! Thanks for both(1080p does matter) informative articles. They will save me about a grand with my first hdtv purchase – no 1080p. Even though THX will not give a minimum fov, do you feel there is an optimum fov? Or an fov minimum at which distance the human eye cannot see the full screen? Any charts? Eugski: I’m working on version 3.0 of the home theater calculator spreadsheet to try to explore just what you’re talking about. I did some research and found that the maximum field-of-view for the human eye is around 140 degrees, so 70 degrees to either the left or the right (obviously, it varies by person). I’m assuming that the closest a person would want to sit would be the location where the viewer looks at one side of the screen and can see the other side with their peripheral vision. To do so, their field-of-view relative to the screen would be 70 degrees. I tried this viewing distance on a few people. The consensus is that they could pretty much see the entire screen regardless where their vision was centered. However, they all agreed that they had to scan around much more and would definitely prefer to sit farther away. But, for an absolute minimum seating distance (resulting in the widest-usable field-of-view), 70-degrees seems to be a reasonable cut-off. Of course, the 720p resolution looked terrible when sitting that close the screen and high-motion scenes were somewhat nauseating. Since I can see resolution deficiencies at the 30-degree f-o-v viewing distance (the longest distance recommended by THX), that is where my front row is going to remain. 1. even if the FOV is 140, the visual acuity falls sharply as one goes to the periphery of the FOV. See http://www.swift.ac.uk/vision.pdf section “Variable resolution” and the nice picture at the end. 2. Seems like people preferred FOV of ~30 rather than that of 70, because the latter force you move your head too often, which is inconvenient. 3. In case you have sub-titles in the movie, head movements are a real nuisance. I would guess that the subtitle width (probably 80% of image’s width) should fall within the 24 FOV. This gives an overall of (24/0.80=) 30 degrees FOV. 4. in the “1080” article you write on the “the most important aspects of picture quality”. You didn’t mention luminance and FOV. Where do you think these two should fall? Yuval: Wow, thanks for the link! That is some great information on visual acuity; much more detail than what I’d referenced previously. I need to see if I can incorporate some of this info into my spreadsheet. I wonder how much of the resolution perception is made based on the central view area. My guess is that as long as the central view is sharp, a lack of resolution in the periphery wouldn’t be commonly noticed. I think a Field-of-view of between ~30 and ~50 degrees is ideal, with ~70 being an absolute widest tolerable (too much head panning if you’re closer than that). As for as the importance for picture quality aspects, contrast ratio is number 1. To get the maximum possible ANSI contrast ratio, the room has to be dark and the luminance has be a minimum level. However, if the room is dark, the luminance requirement is very low. So, although luminance affects contrast ratio, it’s really ambient light that is highest factor there, and luminance is only a secondary contributor to that. Overall, it’s pretty low on the list as long as contrast ratio is maximized. JohnL, in my experience, up-conversion from standard definition source material to “high definition” offers virtually no increase in resolution or viewing experience. So when you watch SD channels, you basically have a SD TV, regardless of the resolution, and sitting close makes it more difficult to enjoy. Those graphs are false. I get you trying to say and all. I merely disagree. First: Early adoption of anything is stupid. Eventually the prices will come down and you’ll be able to buy it for cheap. Look at 1080p screens, they are going massively down in sales because of 2160p screens. Now would be the time to buy into 1080p. Second: Monitor resolution matters insanely with this. A 2160p monitor will destroy a 1080p monitor anyday of the week. Third: You gave no reference to viewers eye sight and rate. You simply said that farther away offers no benefits. Did you know there have been many studies with the resolution of the eye and put it around 30000 x 20000. So until we reach that limit, screen resolution WILL matter. Stop trying to plug your early adoption into 1080p as not a failure. You are a photography enthusiast, you should’ve known that higher resolutions matter immensely. Unless that was a lie? Anyway, study more instead of wasting peoples time. Carlos, I created the chart myself using the principles that apply to the 20/20 eye chart / vision test.